- Size: Too large to tell. - Climate: Depends on the season and what part of land it's near. - Description: The seas are the only means of travel to get from one land to another. The seas are very rough and many battles took place on it. Many lives and ships were lost due to its storms. Its crystal clear water attracts many tourists and adventurers year round. - Races That Populate The Seas: All races travel by sea, but it is mostly inhabited by Sea Folk and the sea creatures that live under its waters. Pirates are also known to travel the seas and hijack ships. - Climate: Change of seasons in most areas. - Description: A medium sized land filled with large towns, large cities, and populated by races of all kinds. Grasslands, mountains, forests, lakes, and deserts fill the land's surface. The land is rich in all kinds of supplies and is equipped with the most advanced technology. It's strong and large military dominates the other lands. The land's laws enforce that every resident is to be treated equal and is allowed to have his or hers freedom and rights and is not to be controlled by an empire. - Description: A large land similar to Stafnar, except that laws are not enforced. Battles and wars make the land a place that is not enjoyable or peaceful. The land may be larger then Stafnar, but the military is not as strong. - Climate: Change of seasons in most areas, but gets extremely cold far up north in the mountains. - Description: A very large land with very little military and supplies. The land is ruled by a small empire and very little freedom and rights go for the residents of the land. The land is covered in mountains and forests. Far up in the mountains, it can get extremely cold. Travelers come to attempt to climb the mountains for a challenge since no can seem to make it to the top of its peaks because of the storms. - Climate: Mostly hot and humid. There are no change of seasons. - Description: A tropical land filled with jungles and all sort of creatures that lurk through out its surface. Volcanoes are known to inhabit and threaten the land. A race known as Snake People control the land. The land's many dangers make survival very complicated. No laws, military, or even supplies exist, which makes it a very unpleasant place where no one wants to journey. - Climate: Mostly hot and dry. There are no change of seasons. - Description: A hostile land filled with deserts and mountains. Its violent sand storms make survival hard and the land an unpleasant place. Desert People control the land and are a threat to all other lands. The military is strong and very advanced, but will never beat Stafnar's. 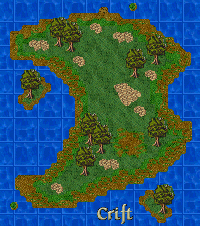 - Description: A small tropical island similar to Amadon that no one knows of except of the race that populates it. There isn't much known about the island and other races besides Frog Folk have never journeyed its surface. - Climate: Very hot and dry. There are no change of seasons. - Description: A small disserted volcanic island that has no grasslands, forests, or even lakes. Its little resources make it an unlivable place. There's no towns or cities, unlike the rest of the lands and there's no military of any kind. The island is occupied by volcanoes and nothing else. The island at one point in time was like Amadon and Saron, but its volcanoes destroyed it and made it the way it is today. - Climate: Freezing cold. There are no change of seasons. - Description: A very large and icy land. Its surface is unlivable to all races and no one knows if the land is inhabited by any living creature. It's cold and unbearable and no one has ever step foot on its surface. - Climate: Mostly hot, humid, and very stormy. There are no change of seasons.